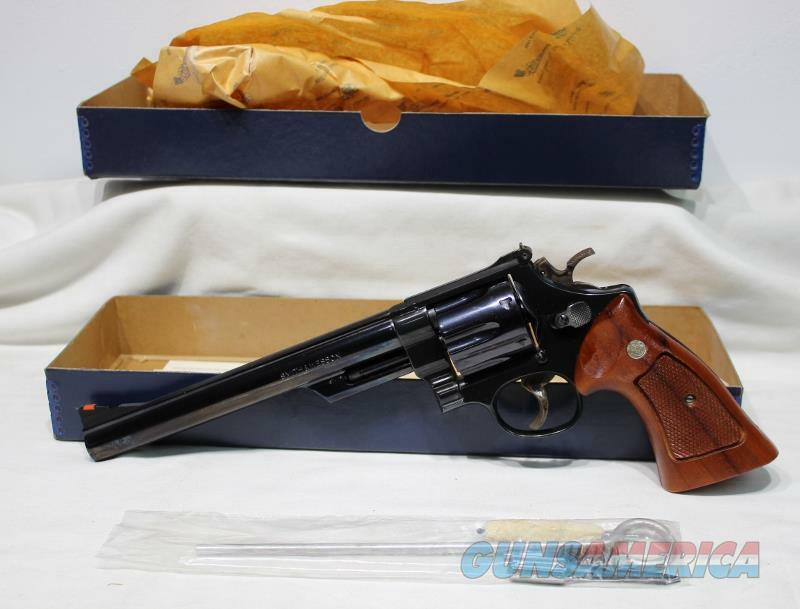 Description: S&W 25-5 8 3/8" bbl, 45 Colt, case hardend hammer and trigger, wide trigger, adj rear sight, there is some slight rust on top of sight, there is some list rust on the back strap- did not try to get it off just put oil and rubbed with nylon brush, there is some rust under the trigger guard, the velvet on the inside of the wooden box is coming apart, the gun was not stored in there, has all of the papers and cleaning rods and brushes, great looking gun, high polished bluing, this is the original version made before 1987, comes with outer shipping box matches gun and inner blue box, serial #N696XXX, NEW OLD Stock, We are a FFL, Florida residents add sales tax for your county, there is no local pick up and we do not have a retail store for you to come see the item. The price listed is a cash price; credit cards add 3% to the total if over $100. We do not give out the reserve so please don’t ask, your email will be deleted with no answer. By committing to buy this item or gun you are saying that you are aware of all of the laws and restrictions in your state and you can lawfully own this item or gun. If you are in CA please add $15 for paperwork. This item must be transferred to a FFL. Money must be here within 5 days of the end of the listing. Transaction must be completed within 10 days or the item will be reposted. DO NOT COMMIT TO BUYING THE ITEM UNTIL YOU HAVE ASKED ALL QUESTIONS. Please ask all questions prior to purchase, no questions are answered on Saturday and Sunday. If you do not complete the transaction appropriate nonpaying buyer feedback will be left.